Every year in the run up to Halloween Jason asks some people to write short stories about candy. He then takes those words and turns them into beautifully-designed web pages: candygrams. I encourage you to revisit the wonderful tales from Jeffrey, Frank, Jim, Rob, Mandy, Erin and others. The day I was leaving San Francisco was also the day that thousands of people across the world were attempting to break the record for simultaneously dancing to Michael Jackson’s Thriller. Forget that prison in The Philippines—this was an attempt to thrill the world. The San Franciscan portion was unfortunately scheduled to clash with my departure so I couldn’t make it along to Delores Park to watch the Trammell and the zombies shake their funky decomposing stuff. I wish I could have made it, not because I’m any great fan of Michael Jackson, but because I do enjoy a good zombie gathering (and yes, I know the zombie backlash has already begun but call me old-fashioned). 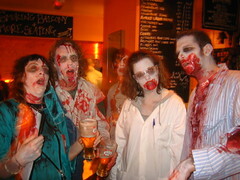 I was excited to hear that there was going to be a zombie pub crawl in Brighton on Halloween. Sophie said she was going so I figured I’d know at least one person (Jessica was going to be busy attending Relly’s night of scrapbooking). But on Halloween evening, Sophie was struck down with a virus. So faced with the prospect of meeting a bunch of complete strangers in a cemetery and shuffling from pub to pub, I figured what the hell? I’ve got a stack of clothes that I’ve been meaning to bring to a charity shop but never got ‘round to. 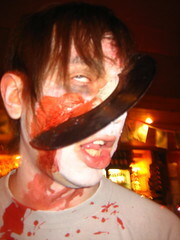 With some judicious ripping, tearing and splattering, they were soon turned into typical zombie apparel. As it turns out, zombies are a friendly bunch. I was welcomed in the Churchyard and we began the evening’s shuffle. I’ve plotted a map of the route from the graveyard to The Earth And Stars to The Eagle to The Freebutt, taking every opportunity to press our decaying flesh against the windows of every dining establishment along the way. 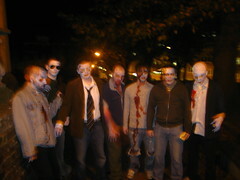 The effectiveness of zombie scariness appears to be directly proportional to the numbers in the horde. 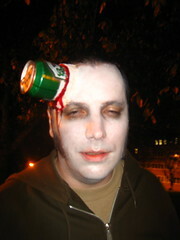 When I was walking to the graveyard, nobody on the street batted an eyelid (this is Brighton, after all). 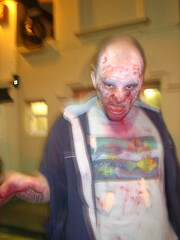 But once I was in a mob of shuffling, shambling zombies chanting “Braaaiiinnnssss…” then the effect was quite different. There’s also something quite calming, almost soporific, about being a mindless zombie in a group of fellow mindless zombies. I found myself staying in character even during pub invasions, ordering beer with grunts and gestures. I thought everyone else was going to stay in character too so I felt a bit foolish when I noticed that my fellow undead were politely ordering their drinks in the Queen’s English. All in all, it was an excellent night of fun. I plan to do it again next year but I need to come up with better makeup if I hope to match the high standards of my fellow crawlers. You can peruse my photos on Flickr taken throughout the evening.